Bratz is an American line of fashion dolls and merchandise manufactured by MGA Entertainment.. Four original 10 inch dolls were released in 2001 – Yasmin, Cloe, Jade, and Sasha, and in 2015, a fifth girl was added to Bratz called Raya, making her the fifth official Bratz. They featured almond-shaped eyes with eyeshadow, and big, glossy lips and lipstick. 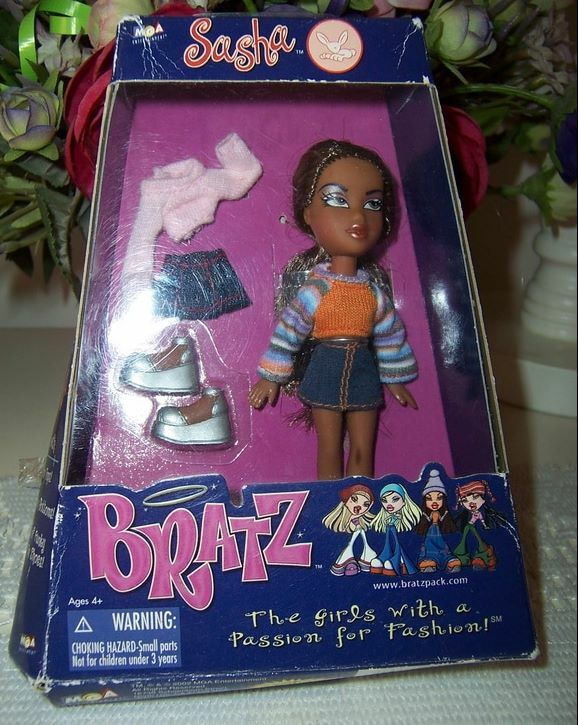 There were spin offs from this line and they were Babz Bratz dolls with accessories and Boyz Bratz dolls, and large Bratz dolls. These large Bratz Babyz dolls are just as cute as their smaller versions. Our doll is called Jade. She is made of sturdy, smooth plastic, can stand up and sit on her own, and her arms rotate fully. Babyz Jade wears silver stud earrings, and a cute handmade vintage knitted romber pants with bib, and a matching little short sleeve top. These have a red knitted hemline and red buttons which look great with her red lips and hed pompom hairpieces. Her pop off ponytails are adorned with red pompoms and her fingernails and toenails are painted bright red. She would be a lovely addition for all those little girls who love their Bratz dolls. Some small marks to legs - told for accuracy and honesty. 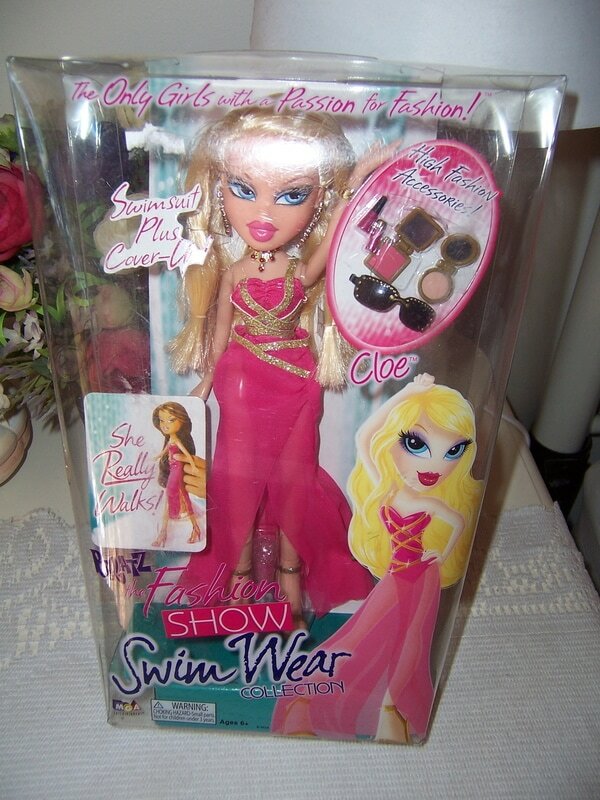 This is a MIB Bratz doll called Cloe who is dressed in the Fashion Show Swim Wear Collection. She is wearing a bright pink swuimsuit plus a cover up. Cloe has never been removed from her box, and comes in her original clothes and hair still in original style. She also has makeup accessories along with sunglasses. The box also states that ''she really walks''. We are also selling Yasmin from the same collection. We are happy to combine postage. 1. Fianna with honey blonde/brown rooted long hair, metal silver chain and botttle around neck, and original outfit. This is a MIB Bratz doll called Yasmin who is dressed in the Fashion Show Swim Wear Collection. She is wearing a white swim suit plus a cover up. Yasmin has never been removed from her box, and comes in her original clothes and hair still in original style. We are also selling Cloe from the same collection. Sasha is a boxed Bratz doll from the Bratz Pack - the mini version. 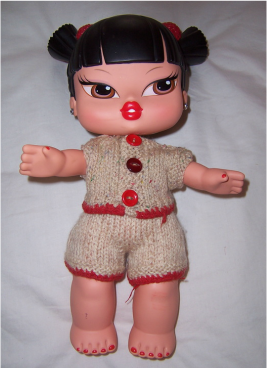 These dolls are quite rare and hard to find especially still in her original box - never opened. She has never been removed from her box, although box does show quite a lot of wear - see photos. We are also selling other Bratz dolls in original boxes never opened. These dolls are in quite good condition, and would look lovely with new shoes and new clothes. They would also be ideal for a project of upcycling, and repainting their faces to make a different OOAK doll with new clothes. 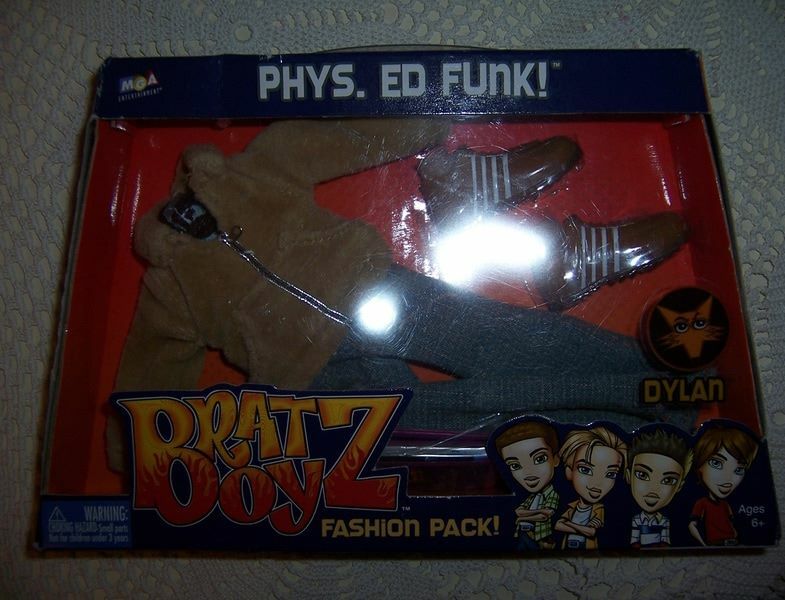 This is a rare 2003 unopened pack of Bratz Boyz Phys Ed Funk clothing set with shoes for Dylan. Even though the box does say it is for Dylan it will fit any Bratz Boyz toy doll figure or any fashion doll of similar size and shape. The box does show a little wear to the sides - see photos but overall it its in good shape.